It's Not Everyday That You Get to Shoot Superman! Beautiful cinematic score that perfectly compliments the beautiful and inspiring work from our friends at Fire Pit Art. No voice over needed. Enjoy. We Shoot Amazing Drone Footage! Some things are just too big to shoot from the ground! That certainly applies to this HUGE manufacturing facility known as Logan Aluminum. This short looping video shows off their plant, offices, and new construction, and is located front and center on the home page of their new website. Two thousand people a day go to work at Logan Aluminum. You wouldn’t expect a manufacturing facility that size to have a family-like culture, but believe me they do! We interviewed twelve employees, and almost every one talked about “one big family.” We produced several videos for Logan, but we really love this video on their culture. Check it out. Would a video like this improve morale at your company and help attract quality employees? Give us a shout! This will later be a car review for our friends at Nashville Exotic Cars. This is a quick preview of the footage to show them what we got. What a car! The John W. McDougall Company has a very rich history and it was a pleasure helping them craft their story. For three generations and over 78 years they have built an amazing company and helped build nationally known structures such as the Epcot Center at Disney, the Opryland Hotel, and the new Music City Center in downtown Nashville. A big thank you to Alec McDougall and Valerie Johansson! Check out our new demo reel....then get in touch and let's craft YOUR story! Shooting mostly video lately, so I really enjoyed getting a chance to shoot some photography of this amazing house for home builder Bill Dryer of River Birch Homes. What a beautiful place! Now That's A Fire Pit! My friends at Fire Pit Art asked me to shoot the test burn for this BEAST! A custom version of their awesome Third Rock fire pit, destined for a major league baseball park in New Jersey. A spectacular site! Really enjoyed working on our second collaboration with physician and Huffington Post writer, Lawrence Rifkin. "A mind-expanding and powerful celebration and exploration. For those who enjoy experiencing the big picture. And just 3 minutes for those who usually do not." I’ve decided that when you lose a limb, you are then endowed with super powers. The goal of this photo shoot was to show other amputee or handicapped patients that they can still lead active lives, pursuing their passions. These people showed that in spades and it was truly inspiring to meet and photograph them! Thanks to my clients, Cathie Pruitt (Strategic Marketing) and Aaron Sorensen (Restorative Health Services). Grill Like a Flippin' Boss! It's always fun to help break a new product. Here's a clever invention from the Flippin' Boss, to protect you from the heat and flames "seeking to CHAR your tender exposed FLESH". Check it out. Here's a fast paced intro we just completed for Titan Web Marketing Solutions. This will introduce a series of 60 second tips about online marketing that we're now producing for a Facebook marketing campaign. A little eye candy always bumps up the production value and gets you noticed. Are you ready to ride? 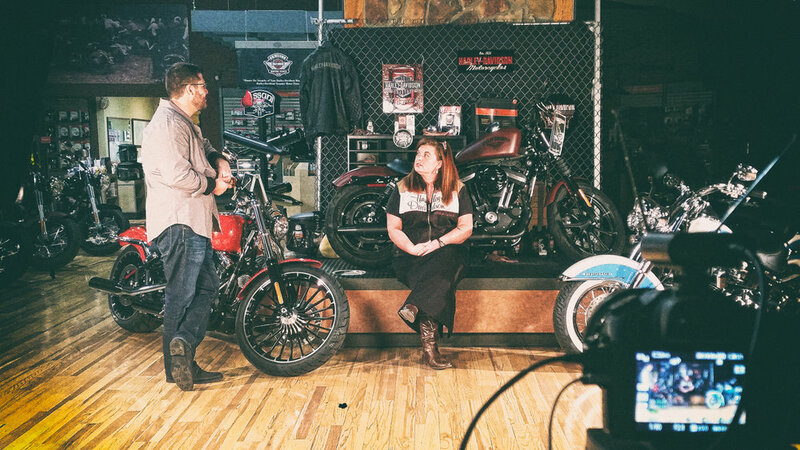 Check the awesome "on the road" shots of the Harley rider in the New Rider video for Bumpus Harley Davidson. Shot from the trunk of a car at 70 mph! Some of the most passionate interviews I've ever captured. Shooting Harleys and interviewing riders for Bumpus Harley Davidson. Freedom of the open road! I love a British accent, plus the guys at Team Aerospace were a blast to work with. They work on airplane components for commercial aircraft. National book trailer for "Go Green, Get Rich"
Just completed this book trailer for author and sustainability advocate, Thomas Addaquay. His new book "Go Green, Get Rich" will soon be released nationally. He has some great ideas on how you can earn money by going green and healing the planet. Congrats Thomas! Can't wait to follow your progress. Check this beautiful (and FAST) Aston Martin Vantage V8 we just shot for Nashville Exotic Cars. This is the teaser for what will be a full on review. Not a bad way to spend a day! What a great group of people at Knowledge Academies, a charter school in Nashville. Passionate teachers and enthusiastic kids are ingredients for a great video! Yep, it's all smoke and mirrors, folks.